The celebrated conqueror of the East, 356-323 B.C. By introducing Hellenic culture into Syria and Egypt, he had probably more influence on the development of Judaism than any one individual not a Jew by race. Yet, curiously enough, there are no personal details which connect him with Jewish history, save that after the siege of Tyre, 332 B.C., he marched through Palestine unopposed, except in the case of Gaza, which was razed to the ground. He is mentioned by name only in the Apocryphal I Macc. (i. 1-8, vi. 2). It is supposed that the Book of Daniel alludes to Alexander when it refers to a mighty king that "shall stand up, that shall rule with great dominion," whose kingdom shall be destroyed after his death (Dan. xi. 3). The vision of the "fourth beast, dreadful and terrible, and strong exceedingly," devouring and breaking all in pieces (ibid. vii. 7), may also be an allusion to Alexander. 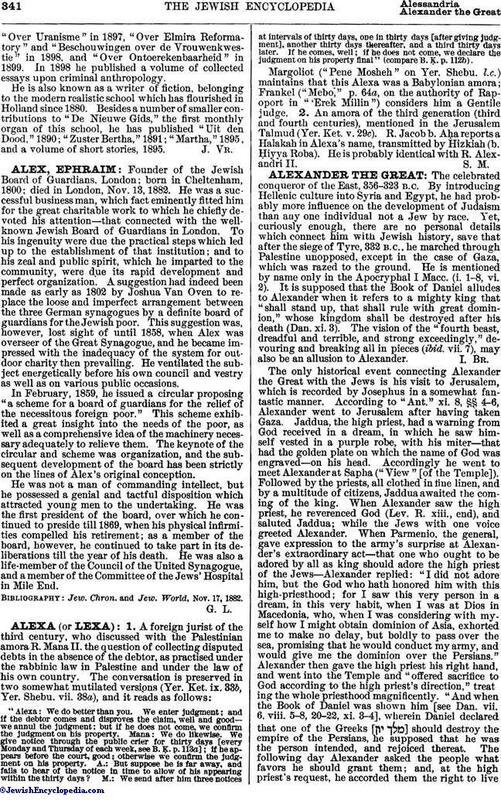 The only historical event connecting Alexander the Great with the Jews is his visit to Jerusalem, which is recorded by Josephus in a somewhat fantastic manner. According to "Ant." xi. 8, §§ 4-6, Alexander went to Jerusalem after having taken Gaza. Jaddua, the high priest, had a warning from God received in a dream, in which he saw himself vested in a purple robe, with his miter—that had the golden plate on which the name of God was engraved—on his head. Accordingly he went to meet Alexander at Sapha ("View" [of the Temple]). Followed by the priests, all clothed in fine linen, and by a multitude of citizens, Jaddua awaited the coming of the king. When Alexander saw the high priest, he reverenced God (Lev. R. xiii., end), and saluted Jaddua; while the Jews with one voice greeted Alexander. When Parmenio, the general, gave expression to the army's surprise at Alexander's extraordinary act—that one who ought to be adored by all as king should adore the high priest of the Jews—Alexander replied: "I did not adore him, but the God who hath honored him with this high-priesthood; for I saw this very person in a dream, in this very habit, when I was at Dios in Macedonia, who, when I was considering with myself how I might obtain dominion of Asia, exhorted me to make no delay, but boldly to pass over the sea, promising that he would conduct my army, and would give me the dominion over the Persians." Alexander then gave the high priest his right hand, and went into the Temple and "offered sacrifice to God according to the high priest's direction," treating the whole priesthood magnificently. "And when the Book of Daniel was shown him [see Dan. vii. 6, viii. 5-8, 20-22, xi. 3-4], wherein Daniel declared that one of the Greeks [ ] should destroy the empire of the Persians, he supposed that he was the person intended, and rejoiced thereat. The following day Alexander asked the people what favors he should grant them; and, at the high priest's request, he accorded them the right to livein full enjoyment of the laws of their forefathers. He, furthermore, exempted them from the payment of tribute in the seventh year of release. To the Jews of Babylonia and Media also he granted like privileges; and to the Jews who were willing to enlist in his army he promised the right to live in accordance with their ancestral laws. Afterward the Samaritans, having learned of the favors granted the Jews by Alexander, asked for similar privileges; but Alexander declined to accede to their request. The historical character of this account is, however, doubted by many scholars (see Pauly-Wissowa, "Realencyklopädie," i. col. 1422). Although, according to Josephus ("Contra Ap." ii. 4, quoting Hecatæus), Alexander permitted the Jews to hold the country of Samaria free from tribute as a reward for their fidelity to him, it was he who Hellenized its capital (Schürer, "Gesch." ii. 108). The Sibylline Books (iii. 383) speak of Alexander—who claimed to be the son of Zeus Amon—as "of the progeny of the Kronides, though spurious." "When the Samaritans had obtained permission from Alexander to destroy the Temple in Jerusalem, the high priest Simon the Just, arrayed in his pontifical garments and followed by a number of distinguished Jews, went out to meet the conqueror, and joined him at Antipatris, on the northern frontier. At sight of Simon, Alexander fell prostrate at his feet, and explained to his astonished companions that the image of the Jewish high priest was always with him in battle, fighting for him and leading him to victory. Simon took the opportunity to justify the attitude of his countrymen, declaring that, far from being rebels, they offered prayers in the Temple for the welfare of the king and his dominions. So impressed was Alexander that he delivered up all the Samaritans in his train into the hands of the Jews, who tied them to the tails of horses and dragged them to the mountain of Gerizim; then the Jews plowed the mountain [demolished the Samaritan temple]." "In Gen. R. (lxi., end) the Samaritans are accused of playing a rôle equally despicable with that imputed to them in the above legend. When Alexander advanced toward Jerusalem, they informed him that the Jews would forbid his entrance to the Holy of Holies. A Jew, Gebi'ah ben Kosem [identical with Gebia ben Pesisa, a legendary character], asked the king, on the hill of the Temple, to remove his shoes and to put on the slippers ornamented with precious stones that he had brought for him, lest he should slip on the pavement of the Temple. Alexander complied with the request, and thus avoided a violation of the rabbinic law. When they arrived at the Holy of Holies, Gebi'ah said to the king, 'We are not permitted to proceed farther' (neither we nor you). 'When I have left the Temple,' replied the king, 'I will straighten your hump' (Gebi'ah signifies humpback). 'If you do,' answered Gebi'ah, 'you are a great physician, and deserving of high remuneration.'" This anecdote is one of those naive inventions of which many are found in Midrash Ekah Rabbati, and which aim at exhibiting the ingenuity of the Jews in repartee. Alexander is made to play merely the part of a stage-king. (Sanh. 91a, Gen. R. l.c.). "The Arabs accuse the Jews of illegally withholding the heritage of their ancestor Ishmael; the Canaanites complain of having been wrongly deprived of their territory; and the Egyptians claim indemnity for the vessels that the Israelites had taken from them on leaving their country. Gebi'ah meets all these charges with great success: against the Egyptians he proves that it is they that are indebted to the Jews, whom they had exploited without paying them for their work, and Alexander was fully satisfied with the refutation"
These pretended discussions, similar to those reported to have taken place between the Samaritans and the Jews before Ptolemy Philometor (Josephus, "Ant." xii. 1, § 10; xiii. 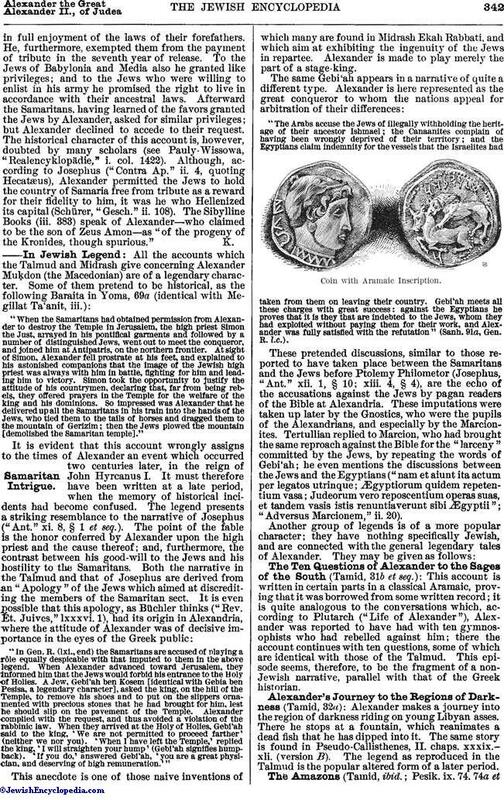 4, § 4), are the echo of the accusations against the Jews by pagan readers of the Bible at Alexandria. These imputations were taken up later by the Gnostics, who were the pupils of the Alexandrians, and especially by the Marcionites. Tertullian replied to Marcion, who had brought the same reproach against the Bible for the "larceny" committed by the Jews, by repeating the words of Gebi'ah; he even mentions the discussions between the Jews and the Egyptians ("nam et aiunt ita actum per legatos utrinque; Ægyptiorum quidem repetentium vasa; Judeorum vero reposcentium operas suas, et tandem vasis istis renuntiaverunt sibi Ægyptii"; "Adversus Marcionem," ii. 20). This account is written in certain parts in a classical Aramaic, proving that it was borrowed from some written record; it is quite analogous to the conversations which, according to Plutarch ("Life of Alexander"), Alexander was reported to have had with ten gymnosophists who had rebelled against him; there the account continues with ten questions, some of which are identical with those of the Talmud. This episode seems, therefore, to be the fragment of a non-Jewish narrative, parallel with that of the Greek historian. Alexander makes a journey into the region of darkness riding on young Libyan asses. There he stops at a fountain, which reanimates a dead fish that he has dipped into it. The same story is found in Pseudo-Callisthenes, II. chaps. xxxix.-xli. (version B). The legend as reproduced in the Talmud is the popular altered form of a later period. Alexander comes to a place which is inhabited only by women. They say to him: "If you kill us, people will accuse you of murdering women. If we kill you, people will say: Behold a king who was overcome by women!" This is the well-known story of the Amazons, but reduced to its simplest expression. In the PesiḲta the town inhabited by the women is called ḳartagene, derived by folk-ety-mology from the Aramaic Ḳarta (town) and the Greek γυνή (woman). Alexander asked the Amazons for bread, and they brought him, on a golden table, a loaf of gold bread. "Do you eat gold bread?" the king then said. "Well, if your desire be for ordinary bread, could you not get it in your own country without coming hither?" answered the Amazons. This satire on the ambition of conquerors recurs frequently in Jewish legends. It does not appear in Pseudo-Callisthenes and in the accounts derived from it; but is found in Plutarch's essay on the virtuous deeds of women. Pythes, a rich Greek in the times of Xerxes, who forces his fellow citizens to work for him in a gold-mine, is served by his wife with gold bread to demonstrate the absurdity of his greed. This moral is connected with Alexander also in another form: instead of the Amazons it was the king Kaẓia who gave the lesson to Alexander. King Kaẓia (ruler of a country situated behind the "Dark" mountains) invited Alexander to hear a lawsuit. The plaintiff declared that he had bought a piece of land and found in it a treasure; he wanted to return the treasure to the original owner, since, he claimed, he had bought the field only. The defendant replied that he had sold the field with everything that it contained. Then the king inquired of one of them: "Have you a son? "; of the other, "Have you a daughter?" "Marry them, and let the treasure be theirs." Alexander laughed at this judgment. "Is my decision a wrong one?" inquired the king. "No; but in our country we would have put the two parties to death and confiscated the treasure." "Do you have rain in your country?" "Yes." "And have you animals also?" "Yes." "Then it is surely for their sake and not for yours that the rain falls and the sun shines upon you." This satirical account seems to be of Jewish origin, although it is, in part, based on a popular theme—marriage as the solution of a lawsuit (compare a Cambodian tale in "Revue des Traditions Populaires," xv. 133). The Jewish form of the fable was embodied in the "Dicta Philosophorum" of Abu al Wafa Mubashshir ibn FaḲih (1053-54), a work which was translated into Spanish, Latin, English, and French (see Knust, "Mittheilungen aus dem Eskurial," Tübingen, 1879). In other Arabic texts the trial takes place before David and Solomon (Weil, "Biblische Legenden," p. 215). The anecdote seems to have been brought to Europe by a priest in 1083 ("Chronique de l'Abbaye de St. Hubert"; Pertz, "Monumenta Germanica, Scriptores," viii. 599). The Talmud (Tamid, 32b) concludes with this narrative: Alexander arrived at the gate of paradise and asked that it be opened to him. "Only the just can enter here," came the reply. "I am a renowned king; present me with something." A little ball was given to him. He put it in a scale; and it outweighed all the gold and silver in his possession. In his astonishment he turned to the rabbis, who explained to him that it was an eyeball, which could never be satiated; but if covered with a handful of dust (buried) it would weigh nothing. This satire on greed, or the ambition to acquire wealth, seems likewise to be genuinely Jewish. This allegory, as it appears in the Talmud, is reproduced in better shape in "Alexandri Magni Iter ad Paradisum," a little work of the twelfth century, which has even preserved traces of its Jewish origin. In this it is an old Jew, of the name of Papas, who lectures the king. Both forms of the legend are evidently connected with a lost original. This appears to be a reminiscence of a narrative in Pseudo-Callisthenes (II. xli.). In the Middle Ages the Jews confined themselves to translations of the romance of Alexander from the Arabic or the Latin, particularly in the form which it had received in the "Historia de Proeliis." 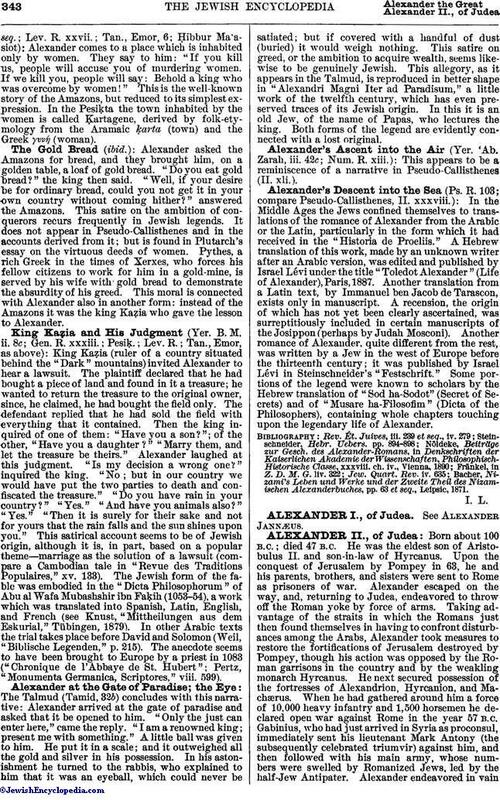 A Hebrew translation of this work, made by an unknown writer after an Arabic version, was edited and published by Israel Lévi under the title "Toledot Alexander" (Life of Alexander), Paris, 1887. Another translation from a Latin text, by Immanuel ben Jacob de Tarascon, exists only in manuscript. A recension, the origin of which has not yet been clearly ascertained, was surreptitiously included in certain manuscripts of the Josippon (perhaps by Judah Mosconi). Another romance of Alexander, quite different from the rest, was written by a Jew in the west of Europe before the thirteenth century; it was published by Israel Lévi in Steinschneider's "Festschrift." Some portions of the legend were known to scholars by the Hebrew translation of "Sod ha-Sodot" (Secret of Secrets) and of "Musare ha-Filosofim" (Dicta of the Philosophers), containing whole chapters touching upon the legendary life of Alexander. Bacher, Nizami's Lehen und Werke und der Zweite Theil des Nizamischen Alexanderbuches, pp. 63 et seq., Leipsic, 1871.